Hello, I am from germany and interested in the basics of Theremin. Especially the sound of the old RCA Theremin I try to simulate with minimal parts of transistors. A 14 mH coil and JFets are used. Knowing various very good circuit examples I follow my own way step by step. The pitch linearity of the RCA Theremin was about three octaves within half a meter. This distance corresponds exactly to the piano keybord. Some initial experiments you can watch on my YT channel, e.g. "Theremin pitch linearity demonstrated with old piano". Your fundamental sound was very good, your RF oscillators seem well buffered from one another. Thanks Jan! I like your linearity video! Feel like showing your circuit diagrams to us (it's pretty easy to upload pictures here and link to them)? No pressure if you don't want to, I'm always curious as to the approaches others take. Thanks Christopher and dewster. Yes, you are right, the sync in one of my videos is wrong due to a scene cut. 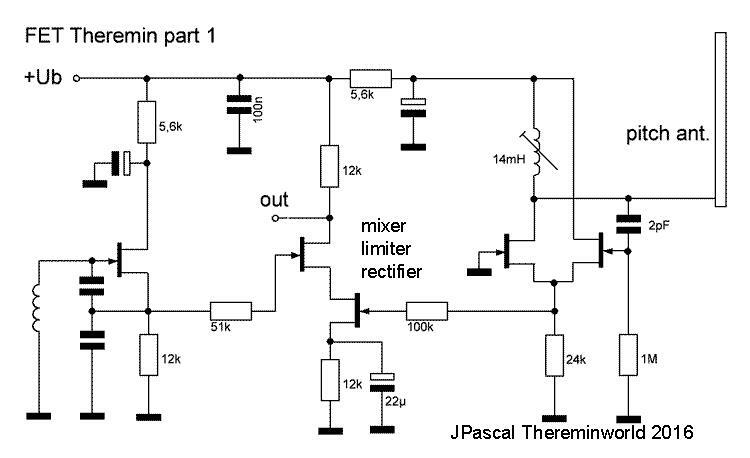 A schematic diagram of pitch oscillator and mixer I cannot upload because there is no active choice in the window for the source of image path. Then add a photo. IIRC you can't name the album until later. Uploaded pics can be linked to in forum posts. Ok. Album is added and renamed. Now I got it via cut and paste the url of the picture. Here is the scheme. Both oscillators are direct galvanic coupled to the jFet cascode. So I think it is similar to the Clara Rockmore RCA Theremin, were a tetrode is used. Thanks JPascal! I assume +Ub is 9V? I've found Theremin oscillators to be infinitely more stable if the voltage to them is regulated. How is the 14mH constructed? What are the values for the fixed oscillator (L & C)? And what is the part number of the FET are you using? [EDIT] I guessed at the unmarked values and plugged it into LTSpice. I'm seeing a somewhat flat bottomed 20Vp-p 330kHz sine wave at the antenna. The mixer needs low-pass filtering, there's a ton of RF hash showing up there that could wreak havoc downstream in the audio chain. Not positive but there may be coupling going on as well which could limit the low end. Oh I see your are deep in materie, dewster! Thank you for your LTspice test and comments! I never got such a kind support. The asc file could be wrong, my LTS IV doesnt open it. Thats what I mean with "my own" way: The electronic components are not yet fixed all, but the principle. Filtering the R.F. is possible by replacing the 12k resistor with transformer (like Rockmore theremin) or by following a RC combination. You see a so filtered shape in my video on oscilloscop. The colpitts oscillator is uncritical. 471 µH solid and 2.2 and 3 nF are used. Tunig only with the high inductance coil. This is a ferrit cup core coil (hope this is the correct expression). JFets are the BF245A type, which are not more in trade, better say not more produced. Similar transistors can be used. Theremin development is like building and preparing a violin. If you want a stradivari you must invest a lot of time and experience. I am limited in both, so I take the know how primarely from the old technique. Shape form fourier analysis of historic demonstrations of RCA theremin, without vibrato and volume effects, are the basic material for me. A radical reduction of electronic components is required, I am convinced. The mathematical simulation, the measures, pspice are done, and I will post the results step by step if there is interest and patience. Playing a theremin ever begins with a tuning like violin. There is no need for stable batterie. Current is very low. I see the point, its critical for an electronic developer. It is all great about violin and others... But... It seems what those like 2 pF values is totally wrong due to high parasitic capacitance of breadboard, what are you think? Of course, you are right, Alesandro. Some pF between neighbored rasters, the half over two banks and so on. I have drilled two ends of short wire as capacitor. The capacitor value is not critical but necessary for oscillator condition. It is an experimental breadbord construction. Looking on the wiring within old RCA Theremin massiv parasitic effects occour. The breadboard is thereby a good simulation of this.